I feel I took a great liberty with my application of “Platforms” in my design. But my reasoning was simple. There were so many mentions in the narrative about the hull being a smooth, cigar shape when submerged and especially when ramming, with nothing protruding from the curved hull, I could find no rendering, old or new, that would fit the description. All views, illustrations, drawings, computer renderings and photos had the platform extended as a flat surface above the curved hull. When Nemo took the Nautilus into battle or even in his fight with the ice at the South Pole, any and all protrusions; Wheelhouse, Railing and Searchlight were retracted. They were either pushed down, folded down of otherwise made non-obstructive. I determined that if the Platform was a recessed flat surface, although not specifically described as such, would not contradict any statement in the narrative related to it. Yet this would provide the walking surface the Captain and crew needed while not protruding above the hull line. Drain holes would be applied along the starboard and port sides so water would drain away when on the surface. In addition, by being recessed, the Main Hatch and bulge of the Dinghy would also be lower so as to not hinder the hull slipping through any obstacle. Recessing the Forward Hatch so it would be flush with the hull when closed would have been a simple measure for Nemo. My inclusion of a second, Aft Platform, was born from simple necessity. And extending the Forward Platform back past the Searchlight was far too impractical for an engineer who could create so many other efficient elements of the boat. So after reading over and over how the crew brought in the massive catches of sea creatures from the trawling nets, trying to find a location for the multiple hatches specified by the narrative, I elected to place a smaller but wider Platform aft of the Searchlight and allowing an efficient place for the hatches into the deck below. The only practical location for hatches was just forward of the Mechanical Room bulkhead and aft of the amidships compartments. While not contradicting and narrative, the result was giving extra work space on deck for the handling of the catches and two hatches for getting all that fish and other creatures below decks. These hatches were also in a good location for helping the frequent ventilation of stale air as well. 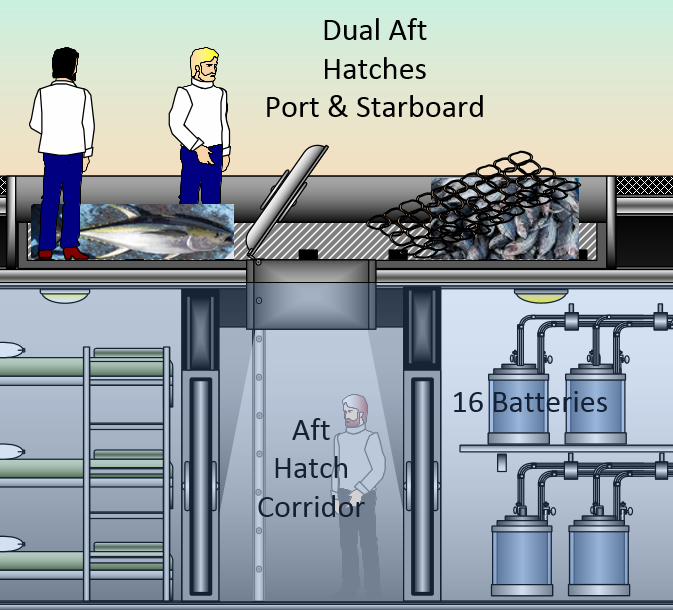 The Aft Hatch Corridor below was also closer to the Galley and its store rooms than any other access. Even after I had added this recessed Aft Platform to my design, I realized another advantage. Lines could be attached to rings on the Platform, draped over the side while on the surface and used to haul up the nets from Nemo’s under sea farming once the dive is complete and they’re back on the surface again. When I thought about the crew trying to bring all that load through the Diving Chamber Hatch while still in diving gear, traipsing it through nearly the entire ship to the Galley storage, I realize the two Aft Hatches could be of great help. That Aft Hatch Corridor could also hold nets and things handily for surface work. Meanwhile, when ready to dive, the two hatch covers would be shallow enough to be well below the hull curvature and not impair any external objects. And, like the longer Main Platform, drain holes would be installed along both sides. The crew tied a ring to a fish tail, the ring to a rope, the rope fastened to the Platform Railing for catching the very large animals. This railing had to be of large scale and very strong. These turtles and several Cacuanes (a yard long and 400 lbs.) could not be taken on-board through the main hatch. Ch 18: Aronnax: “I reckoned that cast of the nets brought in more than 1,000 pounds of fish.” This seems to lend even more credibility to my Aft Platform and Aft Hatches. Ch 20: Aronnax: “Before us rose the Pilothouse in which, I was sure, Captain Nemo himself was at the helm.” So Aronnax could not see into the raised Wheelhouse. Aronnax couldn’t see into the Wheelhouse to make out who was piloting from a vantage point right behind it on the Platform. 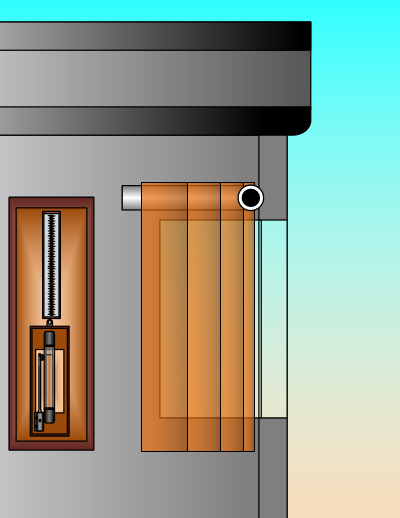 Possibly a little support for my including the curtain on the rear window to block the Searchlight. But can be opened for normal surface daytime viewing rearward. The Dinghy is a “slight bulge” located in the center(?) of the platform. This small boat is approximated at 6′ x 15′ from many old and new designs of “small dinghies” for planning of the platform size. The Main Hatch must be aft of the Dinghy. Forward would not work with the rest of the narrative. I tried placing the dinghy upside-down as depicted by others, but ran into many issues and conflicts. Plus, Verne did not describe it that way, only how it was accessed. Entering upside-down might work, but bringing that heavy dinghy back from the sea and re-seating it for submerging, upside-down, would have presented many difficulties for the crew and other issues. Tough enough when upright. I made my Platform nine feet wide, which puts it only three feet from the waters edge on each side and two and a half feet above that waterline. There are various references to ladders and to stairs, although central staircase is prevalent. Perhaps we should consider that “ladder” is the nautical term for stair? Can a “ladder” be a term used for a spiral staircase? From the description, the top hull was smooth, polished and only 3 feet above the water line. If the platform is recessed rather than elevated above the hull plates, it makes more sense for that smooth hull. There were platform handrails depicted in some original art work, but not all. But a railing could be folded down into a depressed trough and easily locked with clamps. “Near the middle of the platform the dinghy, half buried in the hull…formed a slight bulge.” Logistics and Verne’s text don’t allow the dinghy to be truly centered in the platform. All other attempts on locating the dinghy, including mine, require great effort by the crew to remove it, get it into the water and, even more difficult, retrieving this skiff and restoring it back again. Even more arduous would be handling the dinghy if stored upside-down. Regardless of Verne’s reference to the dinghy being “light” in weight, I expect it was very heavier than that due to size and sea worthy materials. I may have been able to reverse the central staircase so the dinghy could have been moved farther to the middle of the platform. However, from the tone of the castaways speaking on-deck, they seemed more comfortable sitting on the dinghy ‘hump’ while being near the Wheelhouse watching the Helmsman. So my placement has specific reasoning. CH 6: However, here Aronnax says; “We all three went to find seats near the Beacon, where we were less exposed to the spray from the waves.” I considered trying to relocate the Dinghy farther aft, but that caused more conflicts than leaving it as is. I suppose with my design, they may have sat on the retracted cover from the Main Hatch, the edge of the recessed Platform or even the bare hull itself, as they did on first arrival. Regardless, I didn’t feel this warranted any major adjustments and leave it to the readers/viewers preference. In the narrative, it took quite a while for Aronnax to locate the ‘platform’ on the arrival of the three companions. “I searched all over the outside for an opening, a panel, a hatch, a manhole.” It was stated that he found what ‘seemed to be’ a raised platform. After all those long hours, “Ned by chance felt a large mooring ring fastened to the upper part of the iron back.” This mooring ring may be what I referred to earlier as used for dropping catch lines over the side. Even recessed such as I depict, it could be described as ‘raised’ above the curved hull. They must have been on the aft section of the hull, behind the recessed Aft Platform, stowage hatches and the retracted Searchlight. I estimate nearly 42 feet from the rear of the Aft Platform to the water line at the stern of the hull. I suppose that in the dark, our three survivors could have huddled on that much hull surface without noticing the Platforms or Hatches. After all those night time hours, it was after sunrise and they were finally in daylight. Still they saw not even an indication of a Wheelhouse, Searchlight, Dinghy outline, or other variation in the deck plates. Not by any of the three. Very strange. This would be consistent with my narrow Aft Hatch and the ladder leading down. However, the bottom of that ladder is no where close to the Initial Cell. If the Crew’s Quarters on the Upper Deck were switched with the Initial Cell on the Lower Deck, that would be a very close proximity to the original description. Then, upon release, the walk to the Dining Room would have included one flight of stairs down. Regardless how the pieces of this ‘compartment logistics puzzle’ is worked, all the rooms can not be exactly matched to the narrative description. But each of us who have tried to plan-out this vessel has done their best to make it all fit, one way or the other. All attempts simply show the various options available.